One of the newest designers to be welcomed to Poepke has been quietly designing in her home base of Umbria since 2005. 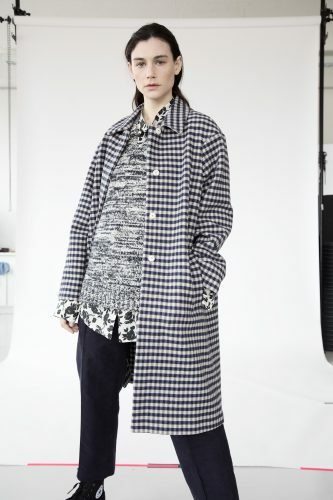 But since then, her designs are hung at Dover St Market, and the hallowed wardrobe of Rei Kawakubo who has become her mentor of sorts. 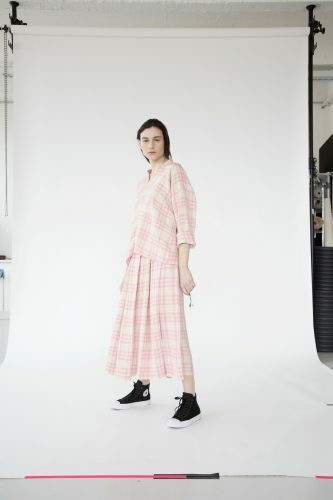 Her clothes incorporate the dualities found in every human, the feminine and masculine (think tartan checks in pink and cream), vigour and lightness (sculpted skirts in the lightest of wool) and poetry and strength (mannish shirts in a stark black and white floral). We talk to Lanzi about her craft, her country and the culture she creates. Your background is in art studies, how has this informed your work? It is generally a great privilege to be able to spend some time studying a favourite subject.. reading and doing research opens and sensitizes the mind. You live and work out of Umbria, tell us what you love most about the region. I like the fact that it is secluded, that the way to reach it is a ribbon surrounded by nature. I like its open horizons and the smell of the seasons, so strong. ‘Restraint’ is a word that is often spoken about with your clothing, where do you think you restrain, and where do you not when it comes to your clothes? Restraint is the inner measure, not always conscious, which makes me stop before feeling uncomfortable. Sometimes may be a limit, but it always speaks of me and keeps me faithful to myself. You’ve been designing since 2005, what inspires you to keep designing? I think it’s my life now. It’s not just about designing, but it’s the whole cycle (from production, to sales campaign) that represents my daily life and what I love to do. Inspiration is a mix of passion and commitment. To view Poepke’s range of Sara Lanzi you can visit here.